This short video shows what it takes to get ready for a weaving workshop. 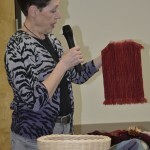 In our Beginning Weavers program, the preparation work of winding and beaming the warp, threading the heddles, sleying the read, and tying on the cloth beam is done in class, but for most workshops, like the one shown here, attendees are given a draft and a materials list and maybe a pre-wound warp before class and are expected to arrive at the workshop with their loom fully dressed and ready to weave. In my case, this was my third weaving workshop, the first being the beginner’s workshop, and the second a card-weaving workshop, where all work was done in class. I’ve done a project at home on a 4-shaft loom, and demonstrated weaving on a pre-dressed loom at the Thurston County Fair, but this is my first 8-shaft project. In this class, we were given a choice of threading drafts a few weeks in advance, and the treadling tie-ups (for floor looms) and lift plans (for table looms) were provided the first day of the workshop. The objective of the class was to demonstrate the effects of different treadling patterns with the same threading. Note during the video, that each step in the threading and weaving is carefully marked off on the draft or lift plan, and a short sample woven before class to check for and correct threading errors. For long treadling sequences, it is wise to make several copies and mark them as you go. Many weavers keep a metal clipboard with movable magnetic markers to keep track of their progress. For simple, repetitive treadling, most weavers simply memorize the pattern, much like musicians memorize a score, stopping only at the end of a complete pattern repeat. The tools used in the video include a warping frame, lease sticks, raddle threading hook, combination threading/sleying hook, and boat shuttles. Not shown is a bobbin winder to wind bobbins or perns for the shuttles. Many weavers use a cordless electric drill to wind bobbins. I also used a metal bar and clamps to spread the warp while beaming (a creative experiment), but many weavers will use an assistant to hold and tension the free end of the warp, and pass the warp through the harness with the heddles moved to one side. This is warping back to front, as the warp is threaded from the back to the front through the heddles, then the reed. Weaving in Twill from Larye Parkins on Vimeo. After 20 years in Ballard, Earthues is closing their studio and retail store. Michele Wipplinger and the Earthues staff invite you to join them on March 8th and March 22nd from 2 pm to 7 pm to celebrate and reminisce about all the wonderful classes and dyeing experiences that have taken place since Michele first opened the doors at the Ballard studio in 1994. Light refreshments will be available. There will also be stacks of textiles, books, raw materials and ethnic furniture for sale. Everything has to be gone by March 31st! The Earthues studio is located at 5129 Ballard Ave. NW, Seattle, WA 98107 and will be open Tuesday through Thursday, 10 am to 5 pm during the month of March. After March, Earthues plans to hold workshops and other events at the Sunset Hill Community Center at 3003 NW 66th Street in Ballard. Dyes will be available through the Earthues web site (www.earthues.com) by email at info@earthues.com or by phone at 206-781-3184. Special pickup arrangements can be made for local customers.